There has been a lot of news about these ‘community facilities’, but is there any progress? In our May newsletter we wrote ….. and a speedy and satisfactory resolution must be everybody’s wish…. but that resolution has still not arrived. The saga is reported in various places. The Comet and Mercury have provided parts of this, with some of their account coming from a facebook group – ‘The Future of Hitchin Town Hall and Museum’, which has sponsored a petition requesting a public enquiry on the tangled process. In addition, Walsworth Councillor Liz Dennis supplied a report on August 11th, in the form of a blog on the Hitchin & Harpenden Labour website, of her meeting with NHDC’s Project Executive John Robinson, which gives many details. This included some useful clarification, but also a contentious account of the changing of the lock on the Museum front door by Hitchin Town Hall Ltd.
One of the Hitchin Town Hall (HTH) directors, Brent Smith, responded to that with a public document (dated August 15th and included in this Newsletter below) that seeks to explain the current position (see HTH Ltd website). This was followed by a letter in the Mercury from our Labour Councillors noting that it seems in part to be due to some Tory infighting and appealing for the Council to sort out the mess. Chris Parker of Keep Hitchin Special made a presentation to the NHDC Cabinet Sub-Committee (Council Charities) on August 22nd, to which Councillor Bernard Lovewell, the Committee’s chair, wrote a response –all available on the NHDC website, along with a tape recording of the meeting. The upshot, after Chris had raised various good questions, was for the chairman to point out that many questions were for someone else in the Council to answer – and this Sub-Committee could only comment on issues that were directly the responsibility of the Hitchin Gymnasium and Workmans Hall Trust (HGWHT). 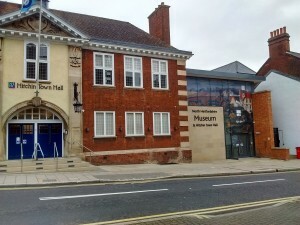 HGWHT hold responsibility for part of the site (where the Workmans Hall & Gymnasium stood) and will eventually, hopefully, also take over the legal ownership from NHDC for the front of the museum site (formally 14&15 Brand Street), if HTH and NHDC come to an agreement on that ownership. Later in the meeting John Robinson gave an oral report on The Museum & Town Hall, which is also recorded and available. Meanwhile, Hitchin Initiative (who were initially involved in the intended community partnership with NHDC to preserve the Town Hall, but handed matters over to Hitchin Town Hall Ltd when that became legally necessary) have made an offer, via Hitchin Committee to NHDC, to broker an arrangement between NHDC and HTH Ltd that would see the Town Hall and Museum opened as soon as possible (HI letter here). Is it possible to summarize the key issues? We will try here. The current impasse is around the ownership of the footprint of 14 & 15 Brand Street. These were bought, by HTH Ltd, to enlarge the main Museum entrance, and that initiative greatly improved the design possibilities. These purchases came from a grant and loans from the Social Investment Business (SIB) and some local benefactors. HTH Ltd intended to pay off the loans and then generate monies for the Hitchin community from the business of running the Town Hall. 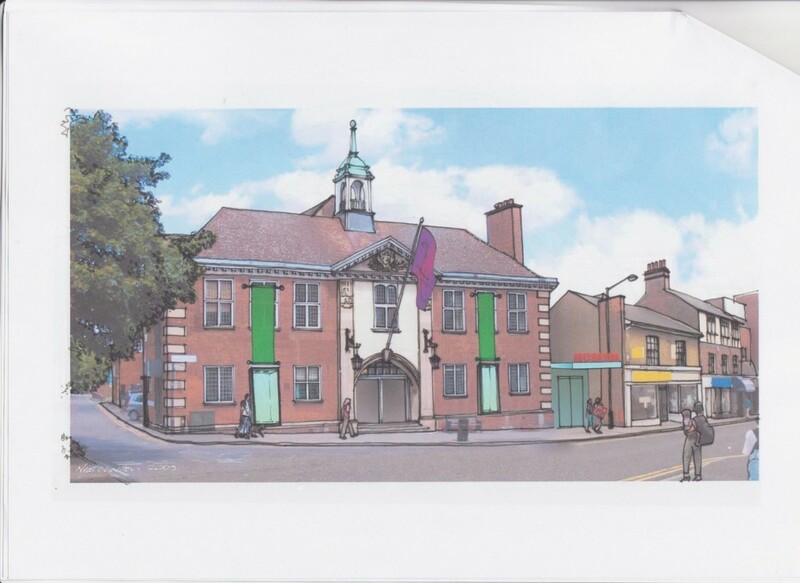 Problems came from changes in what they understood would be achieved in the major refurbishment of the Hall, and disagreements with NHDC over the Development Agreement, which was set up to ensure joint working. They felt they could not generate sufficient income in line with their original business plan. They also could not launch the £400,000 fundraising campaign that was crucial to the running of the Town Hall in the early years. The last straw for HTH Ltd was in the building of that “reversible” concrete wall across the stage, limiting what the stage could be used for (the wall was intended to help provide temporary museum storage, but the basement area for that remains damp and may not be fit for purpose). That, and the location of the cafe, which they had planned to manage, to the rear of the museum, finally scuppered their business plan. SIB then needed to redeem their loan. They waited over a year hoping that a deal could be agreed, and then put up the land of 14 & 15 for sale. NHDC put in a low offer. HTH Finance Ltd was set up with the backing of local benefactors to buy the debt from SIB, because they were not prepared to risk the land being sold to a developer. HTH Ltd could then retain ownership of the plot of land, allowing time for a settlement with NHDC. If they had not done the deal with SIB the entrance area would have been bought by a developer who had other ideas about the use of that land, and it would have been lost forever. HTH Ltd now hope that an arrangement with NHDC can be secured as soon as possible. It would seem that there are issues on both sides that have brought the project to the present impasse. HTH have all along wanted to ensure that a significant community asset was retained and improved for the benefit of the town. Unexpected actions taken during the development have adversely affected what HTH perceived as the best type of development to enable them to manage the facility to the maximum benefit of the town. Is it possible to resolve this impasse and get the museum working and open? We hope so and recommend the proposed mediation by HI to both parties and very much hope that it will be successful.